Filled with in-depth insights and practical advice, theFinancial Risk Manager Handbook is the core text for riskmanagement training programs worldwide. Presented in a clear andconsistent fashion, this completely updated FifthEdition-which comes with an interactive CD-ROM containinghundreds of multiple-choice questions from previous FRM exams-isone of the best ways to prepare for the Financial Risk Manager(FRM) exam. 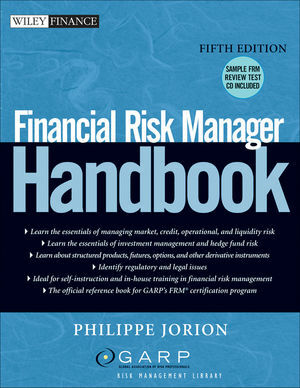 Financial Risk Manager Handbook, Fifth Edition supportscandidates studying for the Global Association of RiskProfessional's (GARP) annual FRM exam and prepares you to assessand control risk in today's rapidly changing financial world.Authored by renowned risk management expert Philippe Jorion-withthe full support of GARP-this definitive guide summarizes the corebody of knowledge for financial risk managers. Financial Risk Manager Handbook is the most comprehensiveguide on this subject, and will help you stay current on bestpractices in this evolving field. The FRM Handbook is the officialreference book for GARP's FRM® certification program. Philippe Jorion is Professor of Finance at the Paul Merage School of Business at the University of California at Irvine. He has also taught at Columbia, Northwestern, the University of Chicago, and the University of British Columbia. He holds an MBA and a PhD from the University of Chicago and a degree in engineering from the University of Brussels. Dr. Jorion has authored more than ninety publications—directed towards academics and practitioners-on the topic of risk management and international finance. He is on the editorial board of a number of financial journals and was editor of the Journal of Risk. His work has received several prizes for research. Dr. Jorion has written the first four editions of Financial Risk Manager Handbook (Wiley), as well as Financial Risk Management: Domestic and International Dimensions; Big Bets Gone Bad: Derivatives and Bankruptcy in Orange County; and Value at Risk: The New Benchmark for Managing Financial Risk. He is also a managing director at Pacific Alternative Asset Management Company (PAAMCO), a global fund of hedge funds. Chapter 2 Fundamentals of Probability. Chapter 3 Fundamentals of Statistics. Chapter 4 Monte Carlo Methods. Chapter 5 Introduction to Derivatives. Chapter 9 Equity, Currency, and Commodity Markets. Part Three Market Risk Management. Chapter 10 Introduction to Market Risk. Chapter 11 Sources of Market Risk. Chapter 12 Hedging Linear Risk. Chapter 13 Nonlinear Risk: Options. Chapter 14 Modeling Risk Factors. Part Four Investment Risk Management. Chapter 17 Hedge Fund Risk Management. Part Five Credit Risk Management. Chapter 18 Introduction to Credit Risk. Chapter 19 Measuring Actuarial Default Risk. Chapter 20 Measuring Default Risk from Market Prices. Chapter 22 Credit Derivatives and Structured Products. Chapter 23 Managing Credit Risk. Part Six Legal, Operational and Integrated Risk Management. Chapter 26 Firm-Wide Risk Management. Part Seven Regulation and Compliance. Chapter 28 Regulation of Financial Institutions. Chapter 29 The Basel Accord. Chapter 30 The Basel Market Risk Charge.